Professor Brask trained as a Dramaturg in Denmark. He has taught in the UW’s Department of Theatre and Film since 1982. He came to the UW after serving as Dramaturg of Playwrights Workshop; as Artistic Director of the Saidye Bronfman Centre Theatre; and as an Adjunct Teacher in the Playwriting program at the National Theatre School of Canada, all in Montreal. 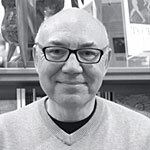 After many years as a stage director and dramaturg, his current research interests focus on Creative Writing, Literary Translation and Judaic Studies. He serves on the editorial board of the UK based refereed e-journal Consciousness, Literature and the Arts as well as on its book series through Brill/Rodopi in Amsterdam. Frayed Opus for Strings & Wind Instruments, a collection of poems by Ulrikka S. Gernes (co-trans. with Patrick Friesen, Brick Books, 2015). Foundational Thoughts in Judaism by Andreas Simonsen, a translation, e-book and P.O.D. Gabriola Island: Fictive Press, 2014. Above Palm Canyon and Other Places in the Mind, poems, (Fictive Press, 2013). A Spectator, a collection of ekphrastic poems, e-book and P.O.D., Gabriola Island: Fictive Press, 2012. Explorations in Andreas Simonsen (working title), translations of and commentary on Andreas Simosen’s work.